We haven’t checked in on our fictional sisters Ann and Lia lately. A little refresher may be in order, yes? We’re following the Napa Dining Table as it is passed down from Ann to Lia as part of my Making it Yours (MiY) series, and seeing how it fares through several style changes. The wall color has stayed the same aqua blue, and she has kept her glasses and bowls plus some new light blue plates. The dresser (being used as a credenza) that she painted to look like the latitude grellow dresser has stayed as well. Lia toned down the crazy mishmash of colors though and is instead focusing more on adding interest through texture and pattern. The cool glass link chandelier and smooth white lamp contrast nicely with her new woven chairs. 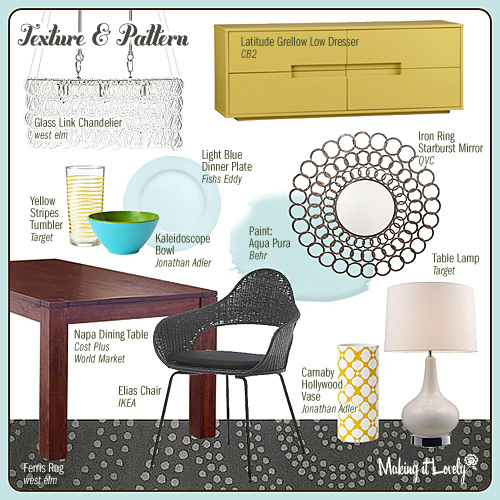 The iron ring starburst mirror plays off of the circles in the rug, and the yellow patterned vase relates back to the dresser. There’s a ton of texture and pattern here, but the overall look works really well without going too over the top. We’ll see one more look from Lia as we finish this edition of Making it Yours. What direction should she go in next? Easy! I’d use yellow rug like this one, warm gray walls, and lots of black and white graphic accents. Or you could do this black and white striped rug, and then have lots of yellow and blue accents (like pillows and vases). I hope that helps! I love the mirror! I am always on the hunt for a fabulous mirror for above my mantel. I keep hoping to score one from my local thrift store. Man, that dresser is fantastic! I love this look. 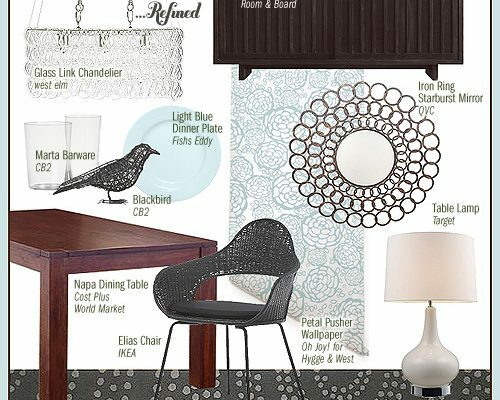 I really like the blue plates and the patterned lamp. looked at the very same dresser just yesterday!!!! love that dresser, so pretty you could design a whole room around it! Maybe this time Lia could go more towards some whimsical and charming decor? I don’t know how you can improve on this one. I love it just the way it is!